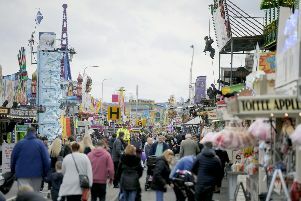 The big crowds attending the Links Market will be hoping for good weather this year. It looks like it is going to be a dry and bright start to the Links Market, with plenty of sunshine across Wednesday afternoon. It will be warmer than of late, although the southeasterly breeze will keep the Fife coast cooler, with a maximum temperature of 9 °C. Thursday will remain dry but mainly cloudy, however, Friday should see longer sunny spells, with temperatures rising to as high as 13 °C, though again the breeze will keep it cooler. There will be less sunshine on Saturday but temperatures are forecast to reach as high as 17 °C in the afternoon, with a slight risk of rain in the evening. Not as warm on Sunday and less chance of sunshine, but it should stay dry, with any rain likely later in the evening. The Market’s final day on Monday looks like being the worst weather wise at the moment, rain is forecast during the day, with the odd sunny spell, and temperatures dropping back down to around 10 °C.